Zandrie Borneman obtained his doctorate at the University of Twente on the topic particle loaded membrane chromatography and is now associate professor Membrane Materials and Processes (MM/P) at the TU/e. In his research, he focuses on the design, development, characterization and application of polymer membranes for sustainable process applications. The aim is to tailor membrane chemistry, design, morphology and characteristics on a molecular level to control mass transport through interfaces for sustainable process applications. 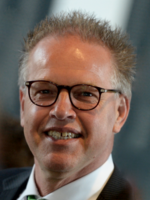 In addition, he is heading the Membrane Innovation Centre Eindhoven (MIC/e). The MIC/e makes use of the knowledge and infrastructure of the department of Chemical Engineering and Chemistry and MM/P in particular. The work carried out by the MIC/e is complementary to the fundamental research performed by MM/P in long-term (four years) Ph.D. projects. Most MIC/e projects vary from one day up to four years and are often practical in nature and are treated confidentially.